Astronomers have known since the 1970s that the Solar Neighborhood lies in the middle of an enormous "Local Bubble" of million-degree, ionized hydrogen gas, surrounded by a wall of colder, denser neutral gas. Within this hot bubble, gas density is much sparser, with some 100 to 1,000 times fewer hydrogen atoms, than the average density of the rest of the Milky Way's spiral disk. The Local Bubble was thought, at first, to be an asymmetric cavity of 330 to 490 light-years (ly) -- 100 to 150 parsecs (pc) -- in diameter. million years (more at CHIPS). One portion of the Local Bubble's wall appears to have collided and merged with the shell of another enormous bubble of hot, ionized gas that's called (Radio) Loop I. Located far above the galactic plane, within 490 ly of the Local Bubble, Loop I's brightest feature is the North Polar Spur, which is thought to be created by supernovae and stellar winds from the 13-million-year-old, Scorpius-Centaurus Association of young and massive, OB-type stars (more discussion and illustrations). In addition to Loop I, astronomers have also detected also two other expanding bubbles nearby, called LOOP II and LOOP III. 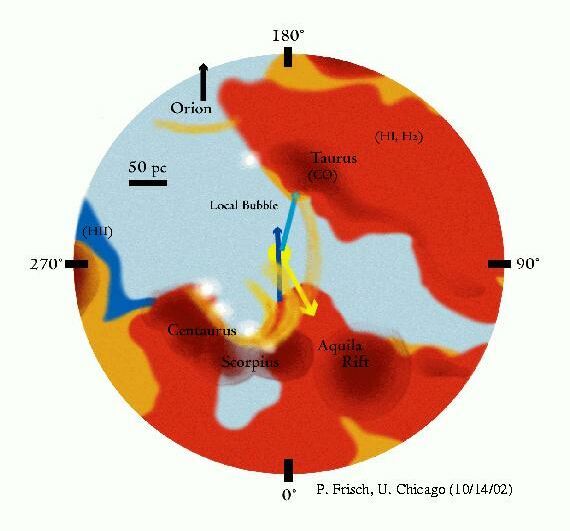 Some wisps of the Local Fluff's denser gas may already have blown into the Solar System earlier (possibly 33,000 and 60,000 years ago) (Priscilla Chapman Frisch, 1997). Astronomers hypothsize that such gas clouds can suppress the Solar Wind so that interstellar gas and dust enters the Solar System in quantities great enough to affect the Sun and life on Earth. 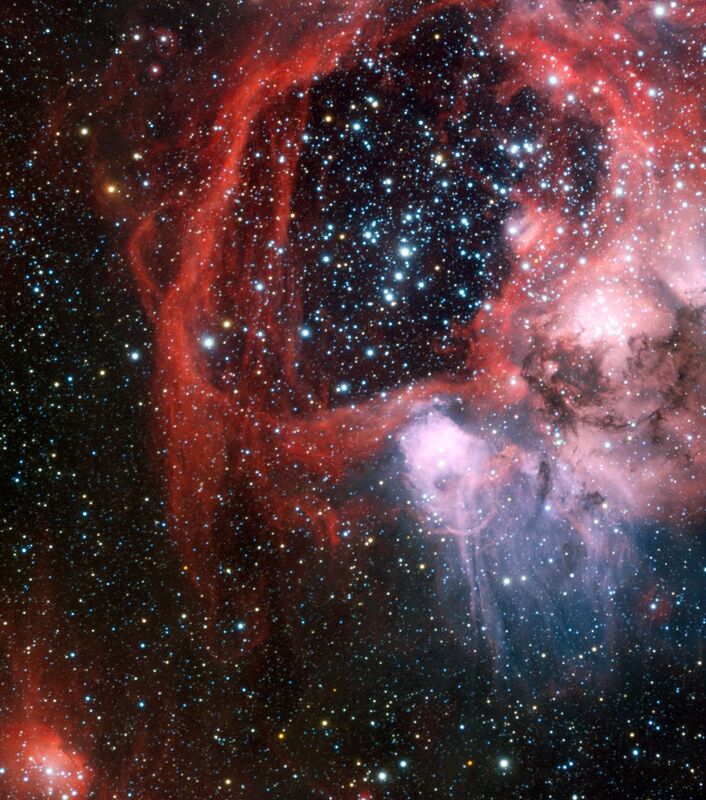 At the moment, a powerful stellar wind from the young OB stellar associations of the Local Bubble's expanding neighbor, the Loop I Bubble, is pushing the Local Fluff aside (at the rate of 12 miles, or 20 km, per second). That expanding bubble, however, is also pushing other clouds of gas towards the Solar System (Astronomy Picture of the Day). Although past absorption-line studies toward stars within 330 ly (100 pc) of Sol had suggested that the the Local Bubble is deficient in neutral gas (e.g., sodium or Na I) (Welsh et al, 1994), astronomers found it slow and difficult to define its actual size and shape. 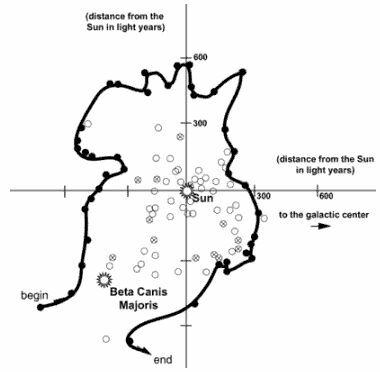 It was known that a neutral-gas-free tunnel extends some 820 ly (250 pc) toward the star Mirzam (Beta Canis Majoris), but a lack of data at high galactic latitudes made it difficult to define the contours of the Local Bubble. Soft X-ray shadowing data toward Ursa Major suggested that the hot gas of the bubble extends at least 1,000 ly (or 300 pc) into the galactic halo (Benjamin et al, 1996). 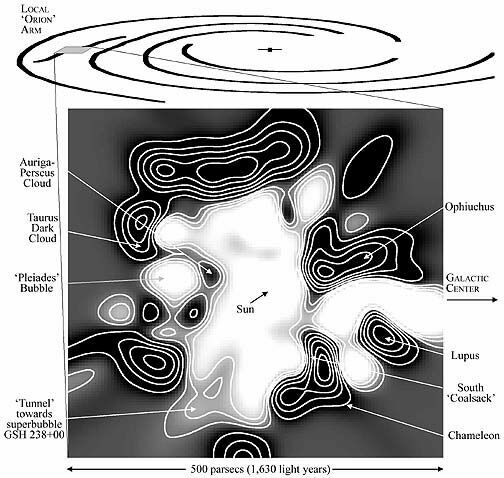 However, the clustering of extragalactic, extreme ultraviolet sources at high galactic latitudes was consistent with one hypothesis that the Local Bubble may actually be part of a cylindrical cavity that pierces the galactic, dubbed the "Local Chimney" (Welsh et al, 1999; and more discussion from CHIPS). On May 29, 2003, a team of astronomers (including Barry Welsh, Rosine Lallement, Francoise Crifo, Daphne Sfeir, and and Jean-Luc Vergely) presented the first detailed map of interstellar space within 1,000 ly (300 pc) of the Solar System. They also announced confirmation of the hypothesis that the so-called Local Bubble of the spiral disk's gas clouds actually pierces the disk of the galaxy, perhaps as the result of exploding stars around one or two million years ago (CNRS press release). The tubular cavity of hot, low-density gas was found to be irregular with tunnels branching off through the surrounding dense gas wall, which is suspected of having interconnecting cavities and tunnels like an interstellar sponge, as first suggested by astronmers nearly 30 years ago (Cox and Smith, 1974). The astronomers hypothesize that energetic supernova explosions created fast-moving expanding bubbles of hot gas that collided with the surrounding cold gas of interstellar space, which in turn became compressed into thin shells. Eventually, these shells of cold gas met other expanding hot cavities and broke up to form small tunnels or pathways between the expanding voids (U.C. Berkeley press release; and Welsh et al, 1999). Such "hot chimneys" have been detected in other galaxies. gas which surround the local cavity. Pleiades and GSH 238+00+09 (more ). By locating stars that showed no absorption by sodium and those that did, the astronomers were able to construct a three-dimensional picture of the edge of the low-density region surrounding the Solar System by observing 1,005 hot and bluish type A and B stars, whose sodium absorption lines are easy to detect from their spectra. Eventually, measurements towards more distant stars picked up large numbers of sodium atoms, indicating the presence of a dense neutral-gas boundary, or "wall," around the local cavity of hot and sparse, ionised gas. The nearest wall is 175 to 190 ly light years from the Solar System, in the direction of the galactic center. By measuring the motion of sodium gas atoms detected along the 1,005 sight-lines, the astronomers hope to say soon whether the gas wall that surrounds the Local Chimney coming towards the Solar System, or is moving away to enlarge the local cavity. If the wall is approaching the Solar System, then it is likely that a distant explosive force is pushing it towards the Solar System. If the wall is expanding away from the Solar System, however, then a supernova explosion may have taken place near the Solar System about a million years ago. The Local Chimney has been around for a few million years. It could easily have been caused by a supernova punching through the top and bottom of the galactic disk, the intense stellar winds from 10 or so hot stars, a powerful gamma-ray burst, or even a large star moving through the area. In theory, any of these could have swept dense, neutral gas out of the region, leaving only very tenuous, hot, ionized hydrogen gas. Assuming that the Local Bubble or Chimney was created by the supernovae of young, massive stars during the past few million years, some astronomers have been looking for their probable source among the 27 member B stars of the Pleiades moving group, which are located towards the nearest part of Gould's Belt of massive hot, OB-type stars (more discussion in pdf). The youngest stars in the galactic region surrounding around the Solar Neighborhood are associated with "subgroup B1" of the Pleiades (M 45) stellar moving group, and astronomers hypothesize that the more massive stars born in this group may have already exploded as 20 or so supernovae over the past 10 to 20 million years as the entire group of stars moved through a nearby region of the Local Bubble (Berghoefer and Breitschwerdt, 2002). The center of mass of these stars is located 135 +/- 15 pc away from the Sun, whereas the distance of the Gould or Gould's Belt of young bright stars in this direction is around 160 pc, whose origins may be 30 to 60 million years old. 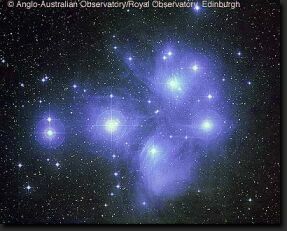 According to (Asiain et al, 1999, in pdf) the Pleiades B1 subgroup may only be 20 +/- 10 million years old. Some astronomers wonder if the Local Chimney's system of interlocking, gaseous cavities is characteristic of the entire Milky Way. 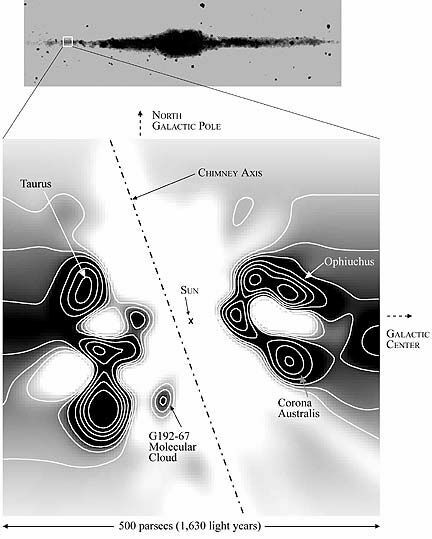 Astronomers looking at an updated map of the cold, local interstellar gas in the galactic plane see an inner empty region with finger-like extensions or tunnels that poke through the surrounding wall and reach into nearby regions of the galaxy, such as the Lupus-Norma, Auriga-Perseus and Scorpius-Centaurus associations of young stars. 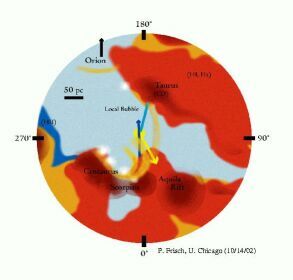 These regions are known to contain large amounts of hot and ionized low-density gas that can be detected at radio and ultraviolet wavelengths. The local void of gas extends out of the galactic disk and stretches into the overlying galactic halo region. Thus, the cavity appears as a tube-like "chimney" that links the gas in the galactic disk with that of the halo. the galactic disk (more ). Galactic chimneys have been widely observed in other galaxies and are thought to be responsible for venting the hot, ionized gas expelled in supernova explosions into galaxy halos. Active vents seen in other galaxies have been called "galactic fountains" while the gas falling back into the disk have been dubbed "galactic rain." Astronomers searching for signs of hot gas in the Local Chimney with the NASA FUSE satellite have detected hot gas that is coming towards the Solar System, which could be part of a fountain that is falling back onto the galactic plane. An enduring puzzle in astrophysics is the apparently, self-regulating process by which diffuse interstellar gas condenses and evolves into stars. The most massive stars explode as supernovae in a few million years after their formation, thereby stirring and heating the interstellar gas out of which they were formed. Thus, astronomers hypothesized that the hot gas generated can regulate the thermal pressure of the surrounding interstellar medium (ISM) (McKee and Ostriker, 1977). Multiple supernovae can create superbubbles of hot gas in the ISM (Bruhweiler et al, 1980) and vent into the galactic halo (Norman and Ikeuchi, 1989). 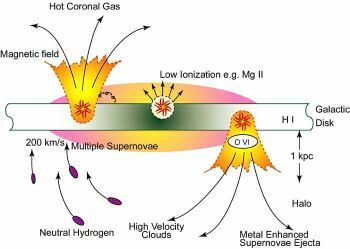 The energy of hot gas injected by the winds of massive stars and their demise as supernovae then shape the structure of the ISM, thereby determining the overall rate of star formation. Although the global interstellar heating processes operating during the hot gas phase of the evolution of the ISM and their relationship to star formation in the Milky Way and other galaxies are now thought to be fairly well understood, the nature of their subsequent cooling remains obscure, despite decades of study (more discussion). Some of the youngest stars found in the galactic region that includes the Solar Neighborhood are found around the Local Chimney, where a compression wave some 30 million years ago piled up a molecular cloud of gas around 600 ly (or 200 pc) across. In the 19th century, astronomer Benjamin Gould found that all the bright young stars observed are located out of the plane of the Milky Way, forming a flattened system of 3,000 ly (900 pc) across with a gradient of 18° with the galactic plane. At one outer edge marked by young stars and nebulae of Orion, this so-called Gould's Belt slips below the plane for 500 ly (150 pc). At the opposite side in the direction of Ophiuchus, Scorpius, and Centaurus, the Belt has a diameter of 150 ly. Gas, dust, young stars, and nebulae are concentrated in several star-forming regions that lie in a ring near the edge of the belt. These regions are known as the Orion Region, the Perseus OB2, Lacerta OB1, and the Scorpius-Centaurus Association. Intense radiation and the violent death of the first generation of stars in Gould's Belt have pushed most of the gas outwards to the edge of the belt, and supernova shockwaves have triggered the birth of most of the bright stars seen today from the Solar System. Within the Belt is a disk of dimmer, less massive sibling stars of the short-lived, bluish stars of the surrounding ring. (More on the origins of Gould's Belt and Disk. 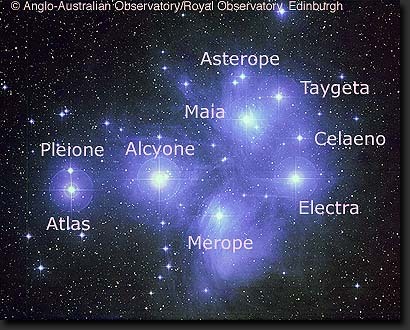 Larger labelled image of the Pleiades. superbubbles) include the Pleiades Cluster. There are three superclusters of young stars located within and around the Solar Neighborhood. Such groups of young stars (several hundred light-years across) were born together, and so they tend to move together for a while before gradually drifting apart. The oldest is a swarm of stars that includes open clusters Hyades and Praesepe, with many stars born around 660 million years ago that are moving in the direction of Constellation Orion. The Sirius Supercluster is around 490 million year old and includes apparently unrelated stars like Sirius, the five stars of the Great Dipper, and Gemma (or Alphecca), which are all moving towards the galactic center. More information may be available from NASA's ADS Abstract Service for the Astrophysics Data System; and and the NSF-funded, arXiv.org Physics e-Print archive's search interface. The European Southern Observatory released some images of a superbubble, Nebula LHA 120-N 44, which is some 325 by 250 light-years wide in the Large Magellanic Cloud -- a satellite galaxy of the Milky Way -- around the Star Cluster NGC 1929 (ESO photo release. © 2003-2011 Sol Company. All Rights Reserved.